New Year’s Eve’s literal hangover was short, but New Year’s Day always seems to be steeped in a figurative hangover. Growing up we’d always stay up until 3 or 4 in the morning to bang spoons on pots and pans, and the next day would inevitably spent sleeping or lazily walking around the house in a fog. This year is only different in that the haze seems to be lasting longer than usual. With the lousiest New Year’s weather Sydney has seen in 20 years, there’s been little incentive to get out of bed in the morning, let alone leave the house. The place we’re staying has a comprehensive DVD collection and a well-stocked kitchen, so there’s been a whole lot of nothing going on lately. There’s been tentative plans to head out to Bondi Beach the last 2 days, but overcast skies and occasional rain showers have quashed that plan twice. Australian TV is a strange Bizarro version of American TV. 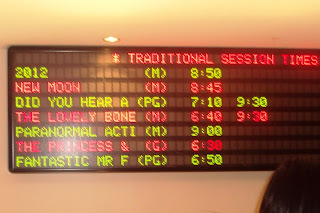 Everything is the same, and yet it’s all different. Diapers are referred to as “nappies”, the channel identical to America’s Bravo network is called the Arena network, and for some reason the [V] network has all kinds of commercials specifically aimed at people that will attend many music festivals this summer, which seems like a ridiculously specific demographic. My favorite part of Australian TV has been a commercial for Chex breakfast cereal in which a child ponders how they put the holes in the Chex, and finally decides that echidnas with special spikes have done it. Sure, Aussie kid. Sure. The Weather Channel, which has a function that allows cable subscribers to get specified weather reports catered to their neighborhood, has been atrociously inaccurate. The one day it called for rain was the only sunny day we’ve had. But all in all, it’s been a nice couple days. It’s been a nice break from Apia’s heat and humidity, and being able to watch TV and music videos and use a hi-speed Internet connection is a sweet change of pace. I’m sure BusyCorner is annoyed, but whatever. The plan is to go to the beach tomorrow. 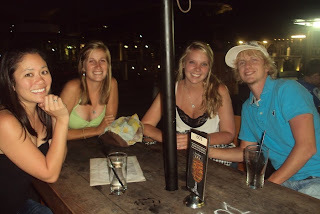 We met up with PCV Erin and her brother and his friend for dinner and drinks last night. 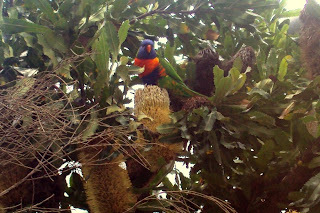 Luisa spotted this wild lorikeet while we waited for the bus this afternoon. 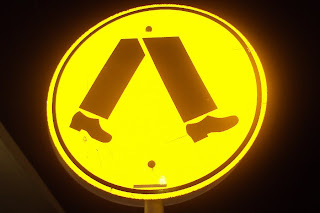 This is the traffic sign that means "look out for pedestrians," but Luisa pointed out tonight that it looks more like "look out for Michael Jackson." Im glad you're having a super time in Syd with Luisa. For some reason I feel myself rooting for your trip's success whilst in my adopted hometown as like when you're in Apia. Anyways if you make it to Bondi Beach, the ribs from 'The Hurricanes' is the best thing there to eat. You can order it to go for eating on the beach. Quick insight on my cultural cousins: V is probably owned by Virgin, who run a lot of summer music festivals (hence the frequent promotion), and nappies are known as such since they are a derivative of napkin, the old name for what one wrapped a baby's tukus in. Also, the Chex commercial has a similar counterpart in the states, but for Cheez-its. Quite amusing, since it involves outlandish ways to squeeze giant cheese wheels into tiny crackers.